Who doesn’t love the Dr. Seuss stories? My favorite as a kid was Horton Hears a Who and of course The Cat and a Hat. 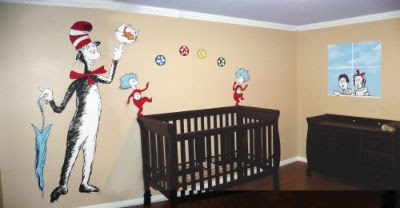 When I found all the awesome nursery murals done in the Dr. Seuss theme. I was so excited! The colors are vibrant and full of life and the ideas and possibilities are endless with all the great stories and characters. I love this one. It was painted by ML Mural artists Shannon and Martin LaPrise. This mural was created with Wallies Wallpaper Stick-ups and not paint. 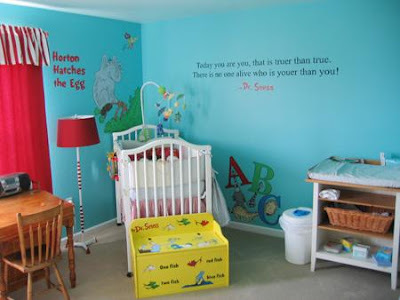 This Horton Hears a Who nursery mural was done by Mary Grace Nichol. Here is another Horton Hears a Who mural. I found this one on www.ratemyspace.hgtv.com. I love the bright blue and green background. I know this last one is not a nursery mural – but WOW!! How creative, right? This fun room was designed by Nancy Hadley who used to work on Extreme Makeover Home Edition. Every child grows up knowing the classic Dr. Seuss stories, such us The Cat in the Hat, Green Eggs and Ham, and Horton Hears a Who. 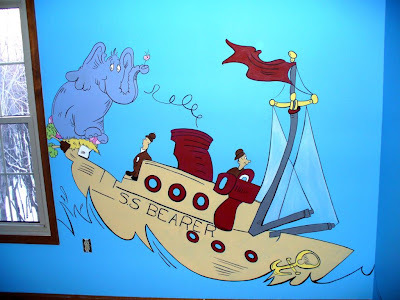 What a wonderful way to spark a child’s imagination with a timeless Dr. Seuss inspired wall mural. I can’t wait till one of my clients hires ME to paint one! I always love to paint something fun and new! OMGosh! My daughters would LOVE this room! It looks like its going to come straight alive!! I love it! It’s SO cute! Isn’t too expensive to have a mural like those in my baby’s room? AMAZING!!!!! I LOVE THESE! 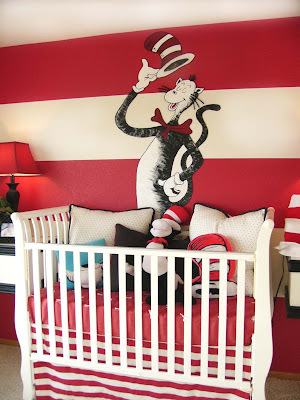 Dr. Seuss is a favorite at our house and our kids would LOVE to have ANY of these rooms!